One of America's historic strengths has been our ability to incorporate aspects from many different cultures to create a stronger whole. Our music, literature, language, architecture, food, fashion, and more have all benefitted. But leadership approaches have remained distressingly Eurocentric. Juana Bordas set out to change this in the first edition of this influential book. She showed that incorporating Latino, African American, and American Indian approaches to leadership into the mainstream can strengthen leadership practices and better inspire today's ethnically rich workforce. This message has only become more urgent. The 2010 census revealed that in four decades minorities will constitute over 50 percent of the population—and in one decade a majority of Americans under age eighteen will be nonwhite. More than ever we need a leadership model htat resonates with our country's growing diversity. Bordas incorporates this latest census data into this second edition, which now identifies nine—rather than the previous edition's eight—core leadership principles common to all three cultures. The new principle deals with intergenerational leadership, of vital importance now that many organiziations will have four generations working side by side. 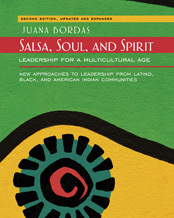 Using a lively blend of personal reflections, interviews with leaders from each community, historical background, and insightful analysis, Bordas illustrates the creative ways these principles have been put into practice in communities of color. The multicultural leadership model developed in this book offers a more flexible and inclusive way to lead and a new vision of the role of the leader in organizations and in our increasingly multicultural world.